Rule 125. For the information of Station-masters, Signalmen, and others each engine must carry the prescribed Head Lamps or Discs, and Destination Boards where provided. Rule 126. Every train travelling on the Line must have a Tail Lamp, properly cleaned and trimmed, attached to the last vehicle, by day as well as by night. The Lamp need not be lighted in the daytime, except in foggy weather or during falling snow, or where otherwise provided, but its presence in the rear of each passing train will furnish evidence to the Signalmen that no portion of the train has become detached. Rule 127. After sunset, and in foggy weather or during falling snow, every engine must carry the necessary Head Lights, and, when running alone, a Red Tail Light also; and except as shown in the following paragraph, or where instructions are issued to the contrary, every train while on any Running Line must carry a Red Tail Light on the last vehicle and two Red Side Lights. Where trains are run in the same direction on Parallel Lines, special Regulations for Head, Side, and Tail Lamps will be made, when necessary, to meet the circumstances of each case. The Guard, if there be only one, or the rear Guard, if there be more than one, must see that the Tail and Side Lamps are kept properly burning when necessary. Rule 128. Engines when on any Running Line without a train must carry a Tail Lamp in the rear both by day and by night. Engines assisting trains in the rear must carry a Tail Lamp. Engines drawing trains must not carry any Tail Lamp. In the case of two or more engines running coupled together without a train, the last engine only must carry a Tail Lamp. Rule 129. Shunting engines employed exclusively in Station Yards and Sidings must, after sunset or in foggy weather or during falling snow, carry both Head and Tail Lamps showing a Red Light or such other Light as may be prescribed. 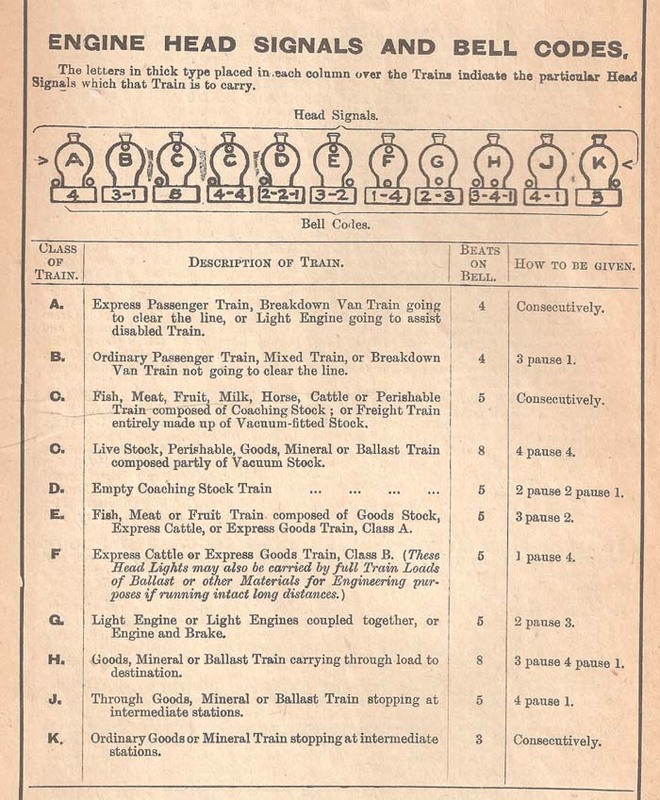 Lamp Headcodes allowed the type of the approaching train to be identified from a distance. The system had been introduced in the 1850s to inform Signalmen of the expected speed of a train through their section. This was particularly useful when operating a Time Interval signalling system, but even after this system was superseded by Block Section signalling Lamp Headcodes were retained. 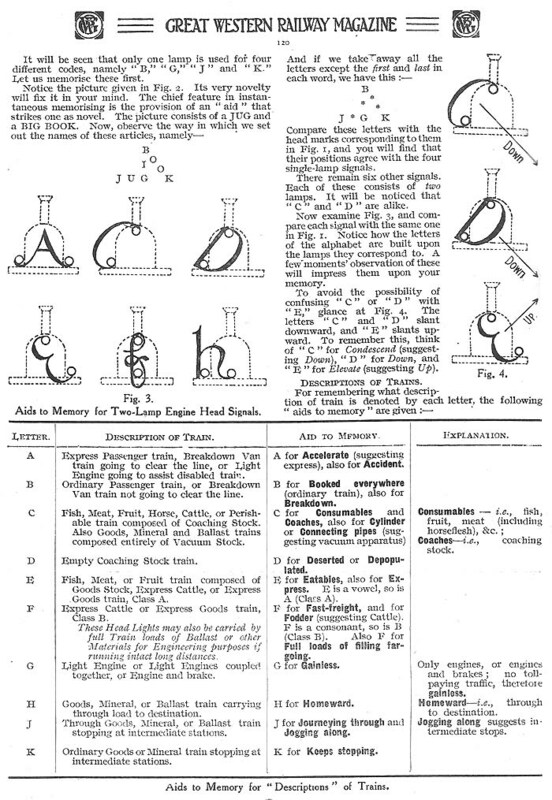 The Headcodes were indicated on the front of locomotives using oil lamps (which were lighted at night) mounted as appropriate on three permanent brackets (lamp irons) fitted to the buffer beam and a fourth in front of the chimney (later this upper bracket was moved to the top of the smoke box door). On the Great Western Railway these oil lamps were initially painted red, but the colour was changed to white after December 1936 (CME Circular 5746), although the process was gradual and took several years to complete, during which time trains with either red or white painted lamps and sometimes both could be seen. To complicate matters some Lamp Headcodes had different meanings in different companies and at different time periods, with some companies also using additional positions and coloured discs instead of lamps. This is despite the Railway Clearing House (RCH) issuing a number of standard Lamp Headcode arrangements. Even within the same company the lamp positions and their meanings were occasionally changed. 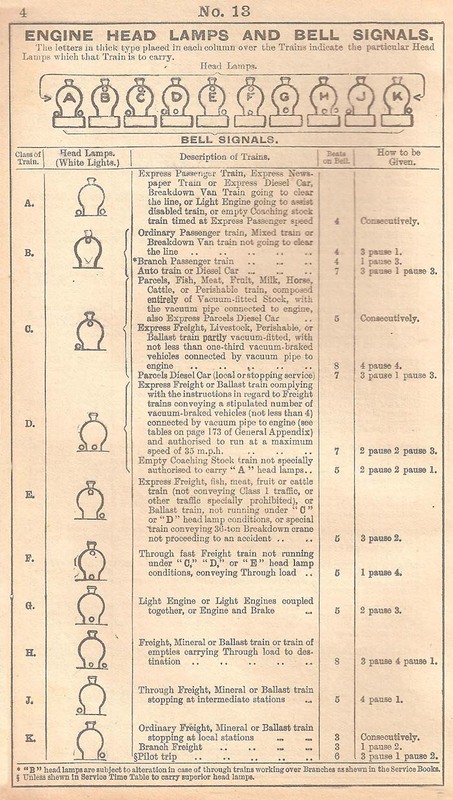 On the Great Western Railway there were several versions, two of which plus the British Railways version are described below on pages from official Service Time Tables. These also indicate the corresponding bell code used by the Signalman to describe the train type, when informing the neighbouring Signal Box of the train entering their section. Tail lamps were essential in maintaining the safety of the railway. In an era when a significant number of trains consisted of wagons with unfitted brakes, the presence of the Red Tail Lamp on the last vehicle of every train confirmed to the Signalman that the train was complete. If the Signalman could not observe the Tail Lamp when it passed his Signal Box, that train needed to be brought to a halt and both following trains and oncoming trains on that line or adjacent lines were also halted in case any wagons in the presumed parted portion of the train had derailed and were causing an obstruction which might put these trains at risk. When on running lines (as distinguished from siding lines), a tail lamp shewing a red light during darkness, is carried on the rear of the brake van and this lamp serves the purposes:- (a) at night of indicating the position of the train, when stationary, to enginemen and others engaged in shunting operations, who might without it cause an engine or wagon to collide with it, and (b) of indicating to a signalman that the train has passed his signal box with formation complete; in its absence, it is to be assumed a portion has broken away, in which case, it is, of course, necessary to stop the traffic until the stray portion has been cleared. On the Great Western Railway, side lamps are also carried, one on each side of the van, at the rear(on one side only in the case of relief lines), in a higher position than the tail lamp, and these shew red lights to the rear during darkness. Some companies regard the side lamps as superfluous but they have been retained by the Great Western as an insurance of additional warning against improper approach from the rear and for relief line running. Where trains have only to pass over a short and fairly level section of running line, within station limits, as in the case of transfer trips from a goods shed or yard to an adjacent marshalling yard, and the brake van is allowed to be dispensed with, a tail lamp is carried on the last wagon, and a shunter or guard rides on that wagon or the nearest suitable wagon to it. The paper analyses the number and cause of freight train breakaways that had occurred in the Bristol Division of the Great Western Railway during 1918 (total 184) and 1923 (total 112) with the majority of both being attributed to Private Owner (PO) wagons. The context is that annually 124,000 freight trains started from, terminated in, or passed through this division. Side lamps were originally required on every last vehicle, but this requirement was gradually diluted with the General Appendix to the Rules and Regulations (4th October 1920) requiring that "with reference to Rule 127 clause b, on Relief Lines on the Great Western Railway only one side light is required instead of two, and this light must be on the side furthest from the Main running line. Each train on Main and Relief lines must, however, be provided with two side lamps by day and night, although it may only be necessary to exhibit one light. If there is a third parallel line on the same side, such as a Goods Loop Line, a train on that line must not exhibit any Side Lights. While in the General Appendix to the Rules and Regulations (1st August 1936) the requirement was modified to state that Side lamps are not provided on GW passenger, empty coaching stock, parcels, perishable, milk and fish trains. In the case of a Mixed train with a Goods Guards brake van as the rear van, side and tail lamps must be carried as for a Freight train. On Relief Lines on the Great Western Railway only one side light is required instead of two, and this light must be on the side furthest from the Main running line. Except where instructions are issued to the contrary, each train on Main and Relief lines must, however, be provided with two side lamps by day and night, although it may only be necessary to exhibit one light. If there is a third parallel line on the same side, such as a Goods Loop Line, a train on that line must not exhibit any Side Lights." 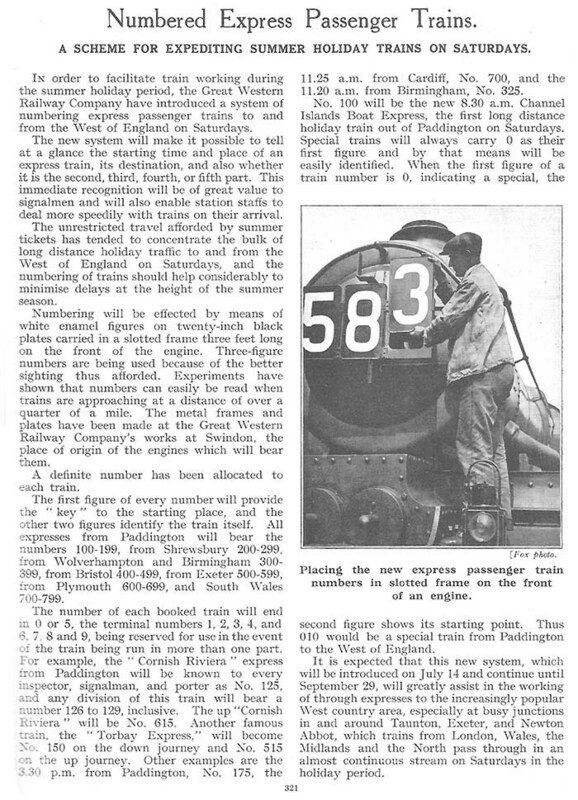 An article from Great Western Railway Magazine (July 1934) explaining Train Identification Boards. With the rise of holiday traffic in the 1930s, the summer passenger express trains particularly to the West Country destinations became so overloaded that it became necessary to run additional relief trains and on Saturdays multiple relief trains were frequently required. To allow these trains to be recognised a new train identification system was introduced in the summer of 1934. It should be noted that the relief trains could run both before and after the main train. Also train numbers did not necessarily remain the same in successive years. The system continued during the initial years of the Second World War and was re-established in the Summer of 1946. By nationalisation the system had extended first to summer weekday trains and then subsequently to the winter timetables. With all passenger express services cover the scheme was radically altered in 1959, when the first figure was changed from indicating the origin to indicating the destination. 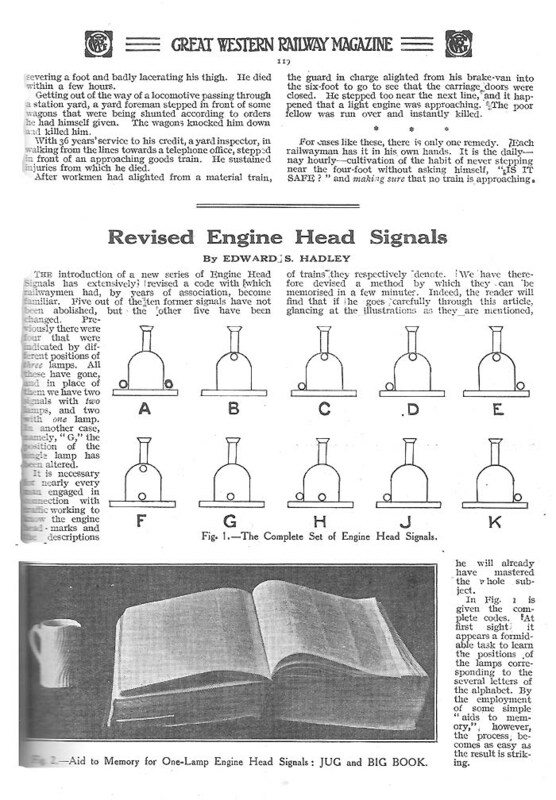 The following year the Lamp Headcode was incorporated into the Train Identification Boards by adding a single character prefix to make these a four figure code. 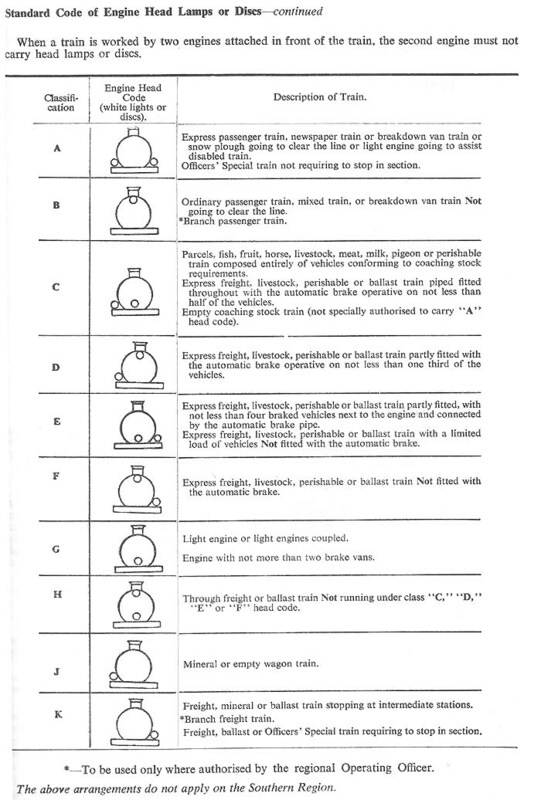 This continued to be used until 1976, when the codes were no longer displayed on the locomotive, but remained in use to describe individual diagrammed workings. 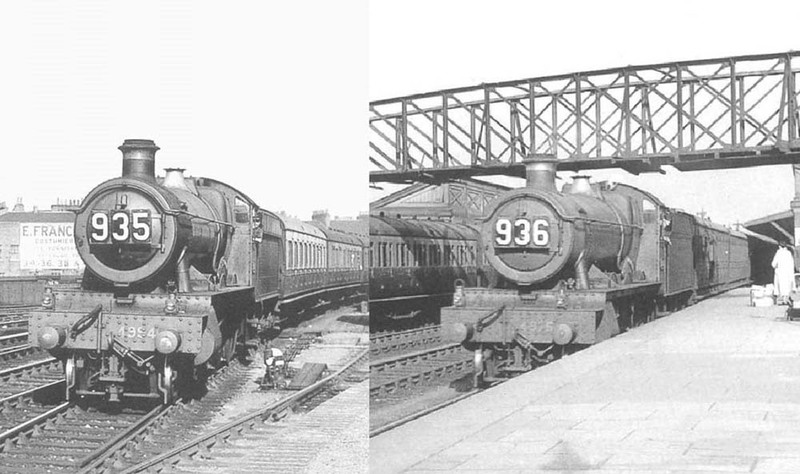 Two photographs of Great Western Railway down expresses from Portsmouth Harbour to Wolverhampton at Leamington Spa on the same Summer Saturday in 1936. Lamp Headcode: On each end of the locomotive's buffer beam are red painted oil lamps indicating that this is a class A  Express Passenger Train. Note that at the end of that year it was decided to use white painted oil lamps instead of red, but the transition was gradual. Identification Number: The frame on the Smokebox door carried three large numbers indicating a specific train. The prefix number '9' indicated that it had originated in the Southern Railway's area and the last number indicated the train portion. Suffix numbers '0' or '5' indicated that the train was the main portion, with each relief portion having their suffix numbers incrementally increased by one, so in this case 936 was the first relief portion train of the main train numbered 935.